I'm happy to present a limited collection of ornate tea ball infusers made especially for this Christmas season. Stainless steel tea ball infusers were adorned with charming tiny (ca. 2cm) dangles made entirely by hand in fine and sterling silver. They will be a perfect Christmas gift for someone who loves unique handmade items. 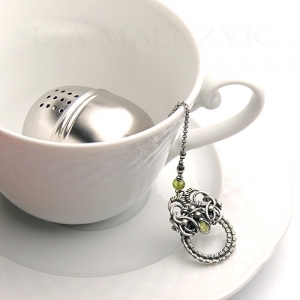 Tea ball infuser: stainless steel, sterling silver chain, fine and sterling silver dangle with peridot. Wash with gentle detergents, do not clean in a dishwasher.